Ashley Zhou (pronounced Zo) was a senior at St Petersburg High School from 2014-15, in this sunny bayside city in the smaller Florida peninsula tucked between the Gulf of Mexico and Tampa Bay. Ashley graduated first in her class and presented the valedictorian address. Then and now, she was the pride of her school; one of only 161 students worldwide to achieve a perfect score in the IB Diploma Programme (DP). Even her CAS project (Creativity, Activity, Service) was a stand-out: Ashley spent a month in her ancestral home, China, teaching English to rural students in the Hunan province. Ashley currently attends Duke University as a National Merit Scholar and has declared herself a pre-med student. Ashley’s IB coordinator, St Petersburg High School Assistant Principal Mrs Susan Farias was eager to celebrate Ashley’s bright success and highlight her IB career to other students at St Pete High, a landmark school founded in 1898 and designated a national historic landmark in 1984. During her holiday break from Duke, Ashley returned to her DP home to speak to students in a special student assembly. Ashley told her audience that even at university, “you can tell when you’re working with an IB student.” A high level of commitment, sharp critical thinking skills, and a sheer love of learning are evidence of kindred IB alumni, she told the attentive crowd. 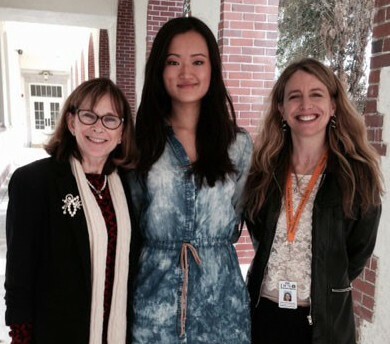 Ashley’s uncommon academic performance attracted the attention of local municipal leaders. 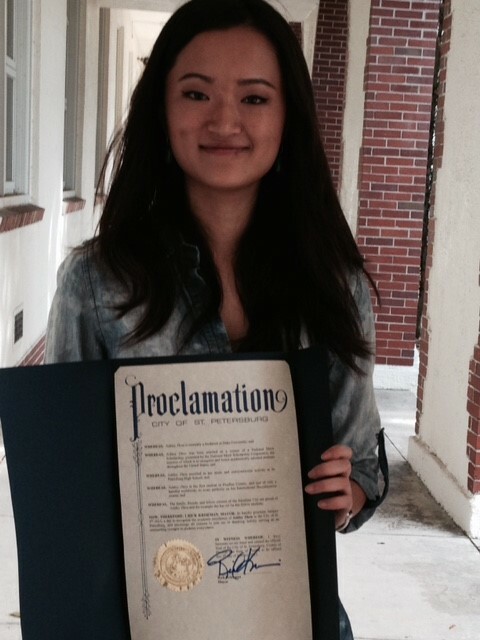 At this very special assembly, IB history teacher Todd Maxwell presented Ashley with a proclamation from the mayor of St. Petersburg that recognized 5 January 2016 as a day devoted to academic excellence in honor of Ashley Zhou, the first student in Pinellas County to score perfectly on her IB exams. Mayor Rick Kriseman proclaimed the day in honor of Ashley to recognize her academic excellence and to thank her for the outstanding example she set for other students. Ashley was joined on the St Petersburg High School stage with nine former IB classmates. Together the group of 10, all students at highly-regarded universities, served as a resource panel for St Pete students who peppered them with questions about how to navigate the IB successfully, how to leverage an IB Diploma into greater opportunities to learn and achieve, and generally, how to realize their dreams. Want to connect with other IB alumni? Join the alumni network and receive—free—the alumni newsletter four times a year. Find out about special events and opportunities for IB alumni—and keep up to date through the IB alumni blog. We didn’t want to miss the opportunity of capturing Ashley in action, so we filmed her in a simple video recording as she encouraged IB freshmen, sophomores, juniors and seniors at her alma mater, St Petersburg High School. She received a perfect score of 45 when she earned her IB Diploma, earning admission to Duke University in the USA.